For 2018, the Audi A5 is fully redesigned. For 2018, the coupe and convertible A5 models return, joined by a new hatchback (the Sportback) that has four doors. Seeing a four-door A5 might seem a little strange to you if you're used to the model just being a two-door. But like the bigger A7 hatchback, the new A5 Sportback enhances the car's cargo-carrying versatility. 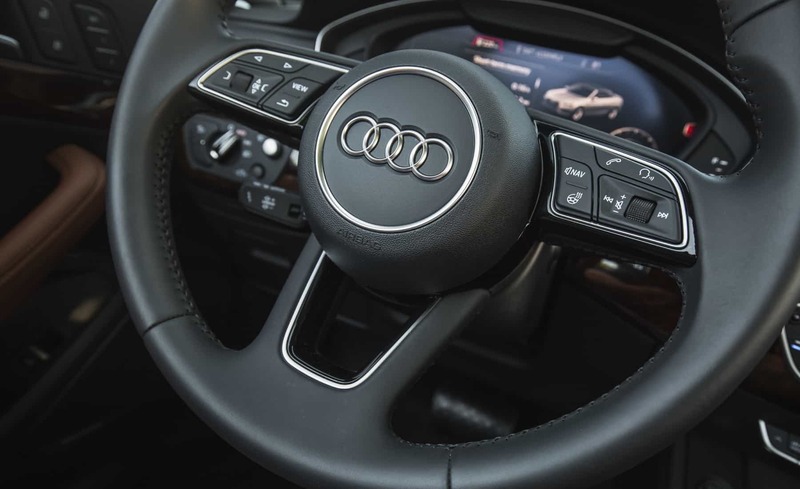 Other notable changes this year include a more powerful four-cylinder engine and the inclusion of Audi's latest technology and safety features. The redesigned 2018 Audi A5 is available in its typical two-door coupe and convertible (Cabriolet) body styles as well as a new four-door hatchback (the Sportback). All A5s are available in Premium, Premium Plus or Prestige trims and are powered by a turbocharged 2.0-liter four-cylinder engine (252 horsepower, 273 pound-feet of torque). All-wheel drive is also included, as is a seven-speed, dual-clutch automatic transmission. A six-speed manual transmission is only available on the A5 coupe. Standard Premium trim features include 18-inch wheels, xenon headlights, heated mirrors, automatic wipers, a sunroof, keyless entry and ignition, selectable drive modes, tri-zone automatic climate control, leather upholstery, power front seats, folding rear seats, an auto-dimming rearview mirror, Apple CarPlay and Android Auto, Bluetooth, a 7-inch infotainment display with Audi's MMI interface, a rearview camera, and a 10-speaker sound system with a CD player, two USB ports and HD radio. Low-speed frontal collision warning and mitigation is also included. Stepping up to the Premium Plus trim gets you LED headlights, auto-dimming exterior mirrors, front and rear parking sensors, Audi's Connect Care (with 4G LTE connection and emergency telematics), rear collision mitigation, blind-spot monitoring, heated front seats, driver-seat memory functions and satellite radio. The Prestige trim rounds out the lineup with a head-up display, a Bang & Olufsen premium audio system, simulated leather upholstery for the center console and armrests, a digital instrument panel, remote vehicle function controls via a smartphone app, a top-down parking camera system, an 8.3-inch infotainment display and a navigation system. Most features on the upper trim levels are available on supporting trims as options. Other add-ons include 20-inch wheels, high-performance summer tires, sporty S line exterior embellishments, adaptive steering, a sport suspension, ventilated sport seats and a heated steering wheel. The Prestige model is also eligible for the Driver Assistance package (adaptive cruise control, lane keeping assist, automatic high-beams and a traffic sign reader) and an adaptive suspension.